PVWatts calculator calculates the energy production and cost savings of connected to the grid photovoltaic (PV) systems throughout the world (USA, UK, Europe, france, Italy, spain...) Totally free, It allows anybody to easily estimate the performance of worlwide PV projects. PVWatts calculator provides also estimated monthly and annual irradiation and energy production in kilowatts and energy value. Users can select a location and choose to use default values or their own system parameters for size, electric cost, array type, tilt angle, and azimuth angle. In addition, the PVWatts calculator can provide hourly performance data for the selected location. PVWATTS v.2 incorporates NREL's 40 km resolution solar resource data to permit site-specific calculations. Accessed through the PVWATTS Version 2 IMS site on NREL's Internet Map Server or through NREL's Unites States Solar Atlas. The user identifies the desired grid cell location to run PVWATTS v.2. PVWATTS v.2 calculates performance using hourly data for a nearby TMY2 site that is climatologically similar, and then the output is adjusted based on differences between the TMY2 site and the grid cell with respect to the solar resource (direct, diffuse horizontal, and global horizontal radiation) and daily maximum temperature. Using typical meteorological year weather data for the selected location, PVWatts calculator determines the solar radiation incident of the PV array and the PV cell temperature for each hour of the year. The DC energy for each hour is calculated from the PV system DC rating and the incident solar radiation and then corrected for the PV cell temperature. The AC energy for each hour is calculated by multiplying the DC energy by the overall DC-to-AC derate factor and adjusting for inverter efficiency as a function of load. Hourly values of AC energy are then summed to calculate monthly and annual AC energy production. Exemple of photovoltaic system design report with PVWATTS : report PVWATTS Calculator Report (example). Run PVWATTS calculator ( online solar grid calculator) for a U.S. location or another International location using world map. 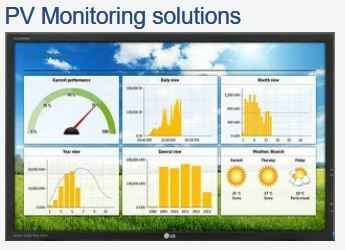 See also online solar photovoltaic software solutions for professional.